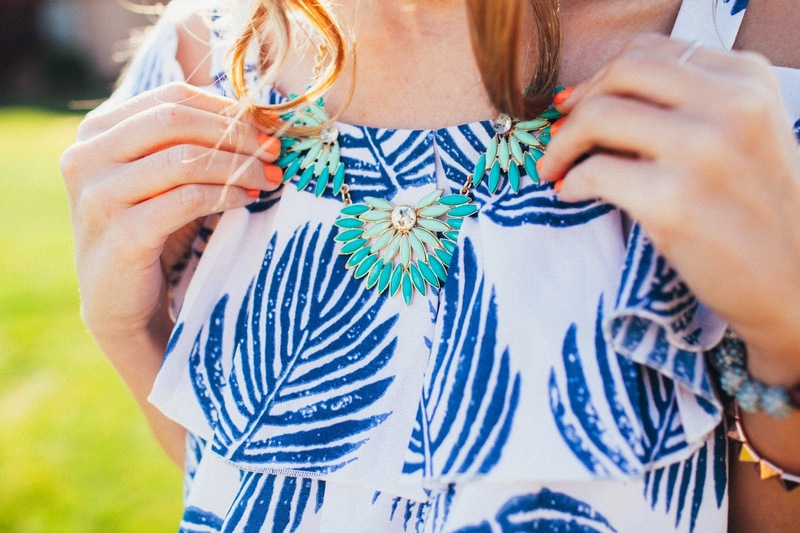 If you can’t tell from this outfit, I’m dreaming of tropical getaways lately. My outfits have definitely been inspired by my wishful thinking as I have been drawn towards bright colors and summer prints of pineapples, flamingos, palm trees…you name it. This ADORABLE dress from Oasap would definitely be the first thing packed IF I was heading on a beach vacation, but will have to suffice as my summer go to as I flounce around town. 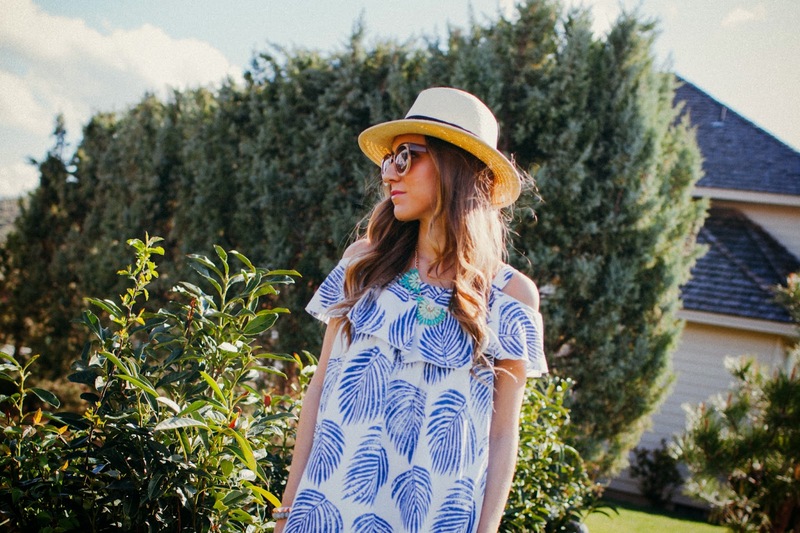 So many things about this dress make it absolutely perfect, from the fresh blue palm print to the off the shoulder ruffle. It also looks adorable belted…which is perfect as it came with the cutest matching belt. I die, guys. It’s just perfection. Pairing it with this minty green gem of a necklace was a no-brainer, as the colors played off of each other so perfectly. I’ve definitely been wearing this necklace far too often lately, as it gives off those beachy vibes I’ve been craving! Oh, and can we just talk about these sunnies from Sunglass Warehouse for a minute?! Guys, these are a STEAL. At only $16, the quality can’t be beat. They are sturdy and I love the fit. I’m thinking I may just need them in the blue fade now too…! I love everything about this outfit! You look gorgeous! SO in love with this dress! It is so pretty and perfect for spring and summer! your photos make me happy- the place you took them are amazing. Loving that dress! 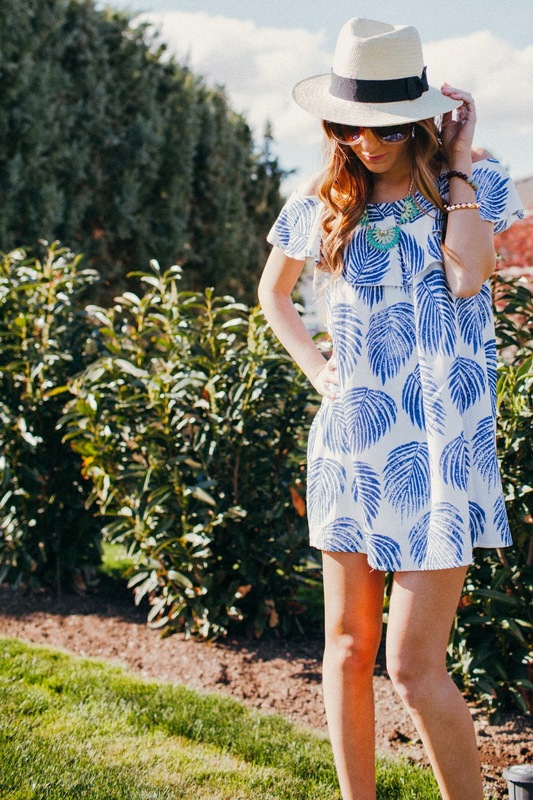 The print is too perfect for Summer!